Like skating on ice, Montreal was tough at first. The New York winter seemed comparatively cozy. As we checked in with the doddering, malevolent Amtrak attendants at Penn station, took our seats and sped up the Hudson past the Jersey Palisades, the sun shone cheerfully. The farther north we traveled, the people outside the stations of the increasingly sparse towns were more thickly bundled. By the time we hit the border, the sky was black. Streetlights revealed storms of snow blowing west to east and billows of steam escaped from the ports of every building we passed. It was obviously cold, and I started to worry. Not being too smart, we decided to walk the 2K from the station to our hostel since we'd been cooped up on the train for ten hours. It did not take long before we realized we'd taken our lives into our hands. I had not felt that kind of cold in a long time, maybe ever. The wind was whipping and when we finally made it to the hostel, someone told us it was -33. Youch. I can imagine no better place to be in the midst of such cold. If ever there was a place to re-kindle one's love of food and reconcile one to winter, Montreal wins. Those folks love their food with a desperate passion and celebrate it in heavy displays of gluttonous revelry. 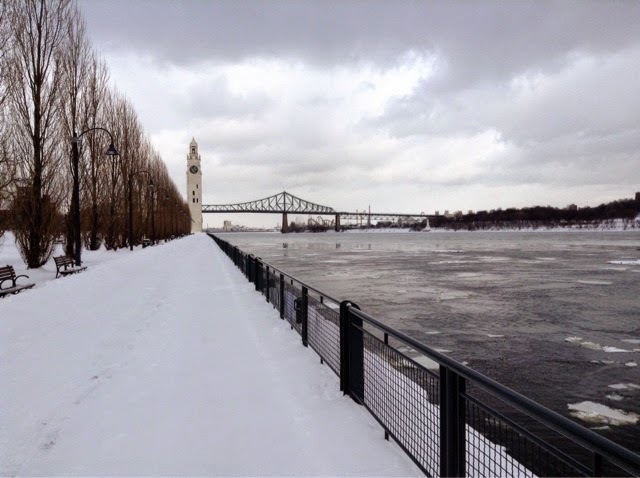 Here's the montrealais' recipe for joy: eat a plate full of gravy-hosed poutine and then go skating by the river or haul your skis or snowshoes up Mt. Royal to make some tracks. We do that in MT, too, minus the poutine and the mild pop music from the loudspeaker at the outdoor rink with the cozy warming hut. We'll get to the paunch-puffing temples of Québécois cuisine another time. For now, I want to focus on the bagel joint that helped me save my self-respect. Our first morning in the city was rough, to say the least. We slept late and missed out on the free hostel coffee and jammy toast. Rising through our Amtrak hangover as though through a lardy aspic, it took awhile to get to the metro station. Our blood sugar was dangerously low and we were both feeling pretty tender. The metro card machine would not accept our debit cards and we could not get cash out of the ATM. Forgot to tell the bank were headed to Canada! Just about to call the bank, I thought to try a lower denomination in the ATM. I came a way with a fistful of plastic cash. Victory. We bought three-day passes and headed for the turnstiles. Bee got through no problem because she read the directions about holding the card in front of a reader on top of the stile. I shoved my card into a slot on the front, it was sucked through the machine and spit out. 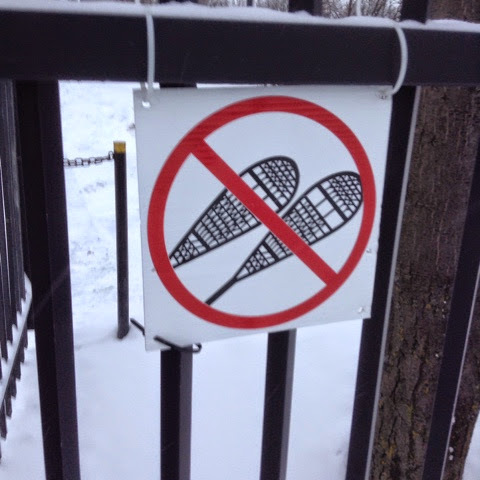 Denied. The metro attendant told me I had broken my card and would have to appeal to customer service which was inside the subway system two stops away. I bought a single-use pass and put it in the slot, it flashed me a green light and I trudged forward into the unyielding bar, bashing my thigh. I nearly came undone. Luckily, the gate allowed me to pass at my second attempt. After a silent and somber ride on the subway, we emerged into a light, sparkling snow and navigated to St.-Viateur in Monkland. As soon as we stepped inside, I knew things were about to take a turn for the better. The place was packed. In the back corner of the restaurant, a wood oven blazed and a guy moved bagels with a 15 foot peel using quick, deft movements. We were greeted by the world's friendliest person and immediately given mugs of quite strong coffee. 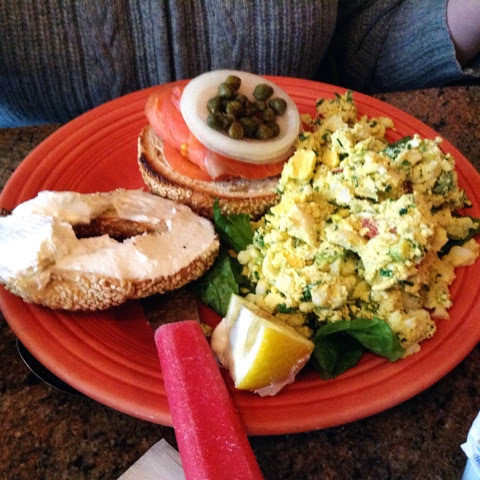 The bagel with lox breakfast plate came with enough egg salad to mortar a small brick house. The Sloppy Johnny (which, as the name of a dish, has rather unappetizing connotations) is a heap of egg, sausage, taters, stringy melted cheese and cretons- a savory pork spread that is a Quebec speciality. 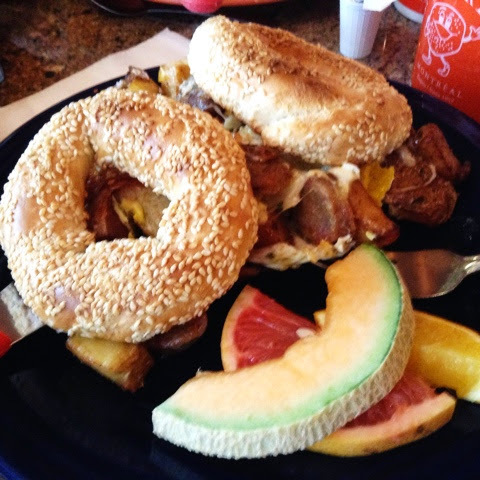 The bagels are fantastic and totally unlike their New York brethren. They are less chewy, more tender and yielding to the bite. But they are firm and hearty at the same time with a terrific toasty flavor from the wood smoke. We were restored and totally stuffed by the time we walked back out into that glittering, sugar-like snow that seemed to be falling constantly without accumulating. The world was companionable and we savored the moments left to us in that great city. I had to buy a new metro pass. Didn't even bother me.